Perfect for my daughter-in-laws cork theme bridal shower favor! Q:Can u personalize the tag with bride and groom names ? And in blush color ?and ribbon? Interested in using at rehearsal dinner, for 26. Q:How are they individually packaged? In a box or organza bag? Q:What is the thickness of each cork coaster? A:They're approximately 1/8" in thickness. 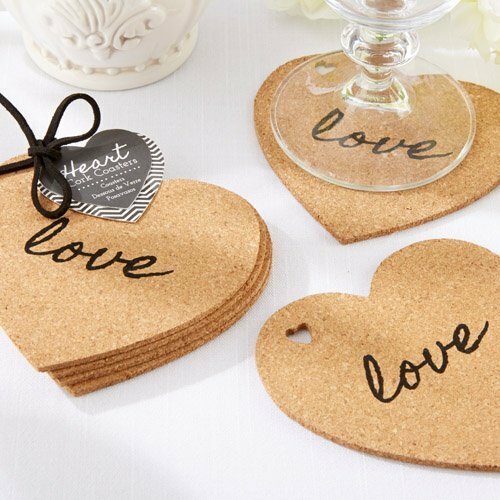 Love is the central theme when celebrating a bridal shower, wedding reception, or anniversary and these heart shaped cork coasters support the theme perfectly. "Love" is delicately scribbled on top of the natural cork material for a modernly elegant and sophisticated look. Use at your next celebration or better yet, give as favors. Guests will appreciate going home with a piece of your heart.